Click here for more in for on the Health Fair 2017 and to book your stall. 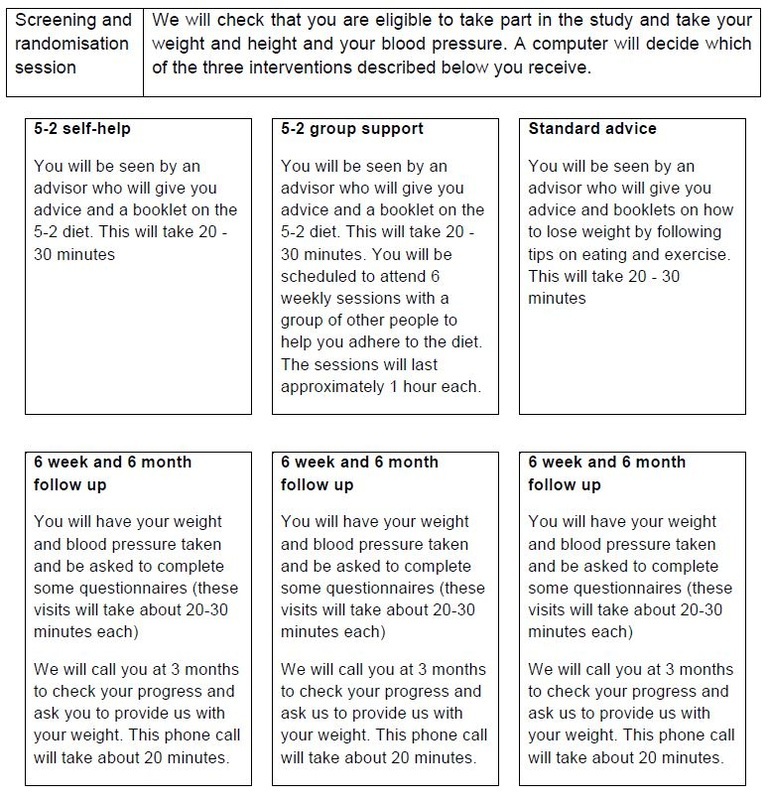 Short-term effects of standard weight management advice and of the 5-2 diet delivered in self-help or group support format. ​Thank you for your interest in this study. The information which follows tells you about it. It is important that you understand what is in this leaflet before you consent to take part. We will go through this information sheet with you and you are free to discuss the study with others (e.g. GP/family). There is information at the end of the leaflet on how to contact us if you have any questions or concerns. The study is being run by the Health and Lifestyle Research Unit at Queen Mary University of London, and is funded by the Medical Research Council. This project is recruiting 300 participants to help with evaluating three different ways that may help people to lose weight. One involves meeting with an advisor who will provide advice on healthy eating and maintaining weight loss together with written guides for use at home. The other involves receiving advice on the 5-2 diet (consuming 500 calories for women/600 calories for men on two non-consecutive days a week) with a guide for use at home. The third involves trying the 5-2 diet in a group setting. The purpose of the study is to compare the three interventions. We do not know currently if any one of them is better than any other. What will happen if you take part? If you are eligible and willing to take part in the study, you will be asked to complete the questionnaire provided with the invitation letter and attend our clinic in Stepney Green. The questionnaire asks questions about yourself, your eating habits, and our dieting history. You will be randomly allocated (by chance) to one of the three treatment options (standard advice, 5-2 self-help, 5-2 group support). If you are allocated to the standard advice and the 5-2 self-help conditions, you will meet with the advisor for one session lasting 20-30 minutes. We will then ask you to come back to check on your progress at 6 weeks and 6-months after the start of the treatment programme. We will also call you at 3 months to check your progress. If you are allocated the 5-2 group support condition, you will be asked to visit the clinic every week for 6 weeks. We will then ask you to come back to check on your progress 6 weeks and 6 months after the start of the treatment programme. We will also ask about your experience of the programme you were allocated to. We will also call you at 3 months to check your progress. If you are randomised to either the 5-2 self-help or 5-2 group support conditions, you may experience some degree of hunger and discomfort on the fasting days. You will receive £20 for attending the 6-week and 6-month follow-up appointments. All sessions will be held at the Health and Lifestyle Research Unit, 2 Stayner’s Road, London, E1 4AH at times agreed with you. You will not be able to take part if you have a BMI of over 45, are pregnant, breastfeeding or planning to conceive within the next 6 months, are diabetic and require insulin to manage your condition, have a history of eating disorders, taking medication that has been prescribed by a psychiatrist, unavailable for the 6-month follow-up, are currently on the 5:2 diet, lost more than 5% of your body weight in the last 6 months, are currently taking part in another study, have undergone bariatric surgery or are unable speak and understand English. We do not expect there to be any risks or side effects in taking part in this study. If you agree to take part, any information you provide will be kept confidential, and only study staff will have access to this data. Should you choose to withdraw from the study, only your data up to the point of your withdrawal will be analysed. After the study is completed the university will store all data collected from this study (including personal data) for twenty years, after which they will be destroyed, as per standard practice. The results of this study may be presented at scientific conferences and will be published in a scientific journal. All data will be anonymised and there will be no information included which could identify you. A summary of the results of this study will be available upon request. Your participation in this study is entirely voluntary, and you are free to drop out of the study at any time. Road, London, E1 4AH, Tel: 0207 882 8230. We believe that this study is safe and do not expect you to suffer any harm or injury because of your participation in it. However, Queen Mary University of London has agreed that if you are harmed as a result of your participation in the study, you will be compensated, provided that, on the balance of probabilities, an injury was caused as a direct result of the intervention or procedures you received during the course of the study. These special compensation arrangements apply where an injury is caused to you that would not have occurred if you were not in the trial. These arrangements do not affect your right to pursue a claim through legal action. If you wish to raise a complaint or would like to seek independent advice outside the study team, you can contact INVOLVE on 023 8065 1088 or via email on admin@invo.org.uk or the Patient Advice and Liaison Service (PALS) on 0203 594 2040/2050 or you can email them at pals@bartshealth.nhs.uk.